One of the things that sets GlobalFingerprints apart from other child sponsorship programs is the commitment to visit children in their homes. GlobalFingerprints care workers make regular visits to the homes of sponsored children to build a relationship with the family, encourage the child spiritually and evaluate their well being. These individual evaluations are extremely valuable for determining the best way to serve each child. Up until now, this information was recorded on paper. This made it more difficult for care workers to measure the child’s progress over time and to spot trends in the community impacting the children. That’s all changing thanks to a team of app developers who donated their skills to help children in poverty. They developed a special app for GlobalFingerprints that enables care workers to record CSI scores digitally. This allows for much more thorough analysis of each child’s progress and also trends in the broader community that need to be addressed. But that’s only the tip of the iceberg. The app also allows the care worker to update the picture of the child, send and receive messages from the sponsor and alert the program manager if there is an urgent need. There is also space for the care worker to record notes on each visit so they can better follow up at the next visit. The app was developed by two highly-skilled developers who happen to be best friends. 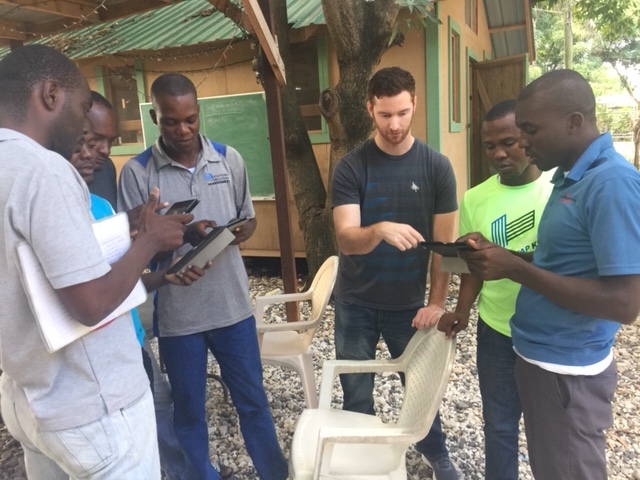 A year ago, Bryan Hawkins went to Haiti with Steve Spellman, GlobalFingperints Haiti Leader at the time, to see the ministry of GlobalFingerprints first hand. During the trip, Bryan learned of the need to better track data. He told Steve he and his friend Daniel could produce exactly what GlobalFingerprints needed. Steve gave the green light and the discussion began to develop what has become known as GF Kids. Daniel Lemburg has done the bulk of the work on the actual app development, putting in over 400 hours of his personal time. Daniel and Bryan have given all of their time for free. They’ve expressed joy and excitement that they are able to use their God-given talents to serve Christ. They’re fully committed to continued refinement and development of GF Kids, a tool that will improve the care workers’ level of personal care for each child. GF Kids was recently launched in Haiti and was extremely well received by the care workers who saw the valuable role it will play. GF Kids has also been launched in Panama. After testing in these sites, further refinements will be made and the app will be expanded to the rest of the GlobalFingerprints sites.